Prelude: Rhinox, the one Maximal who remained unchanged and alive throughout the entire Beast Wars series. 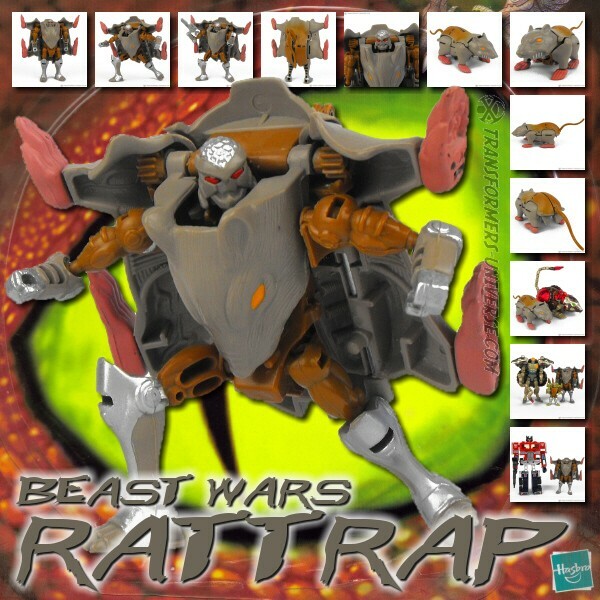 Which is kind of strange, seeing as his original toy was among the weakest the Beast Wars line had to offer. But no matter how he looked in the series, he did get a Transmetal toy, the original version of which I reviewed ... in 2005!? Man, it’s been 14 years already? I’ve been doing this way too long. Anyway, like quite a few other BW toys Transmetal Rhinox, too, got a Fox Kids repaint to coincide with Beast Wars reruns on the Fox Kids station. This is what we’ll be looking at today. Man, 14 years! Really? Robot Mode: Rhinox’ robot mode is mostly blue and grey with some red highlights (such as his face) and some spots of yellow. If you think about it those are almost the colors of Tankor (the on-screen character, not the toy), Rhinox’ evil Vehicon persona. Not sure if that was intentional or not. Anyway, the color swap from the original toy is pretty straightforward as with most of the Fox Kids toys: Grey to blue, brown to grey, orange to red. The formerly blue chromed parts are now a slightly greenish yellow. Overall this is my least-favorite color swap among the Fox Kids toys so far, I must say. Nothing against the blue, but the red face and greenish-yellow don’t look that great on Rhinox, I think. Colors aside, the robot mode is unchanged from the original. A stocky figure, very powerful-looking, with a horn-blade as his only weapon. Articulation is good, though a bit sub-standard for Beast Wars figures, I think. Overall he’s better than the original Rhinox toy, but still not a great fan of this one, either. We would have to wait until 2014 for a really good Rhinox. Alternate Mode: Unsurprisingly Rhinox still becomes a rhino, who’d have thought? Like with all Transmetal figures the beast mode is almost entirely technological. Rhinox is mostly blue and greenish-yellow here and the rhino looks pretty cool, no complaints. Like all Transmetals it also contains a third mode which slightly modifies the beast mode into a vehicle configuration. In Rhinox’ case he becomes a half-track vehicle with tank tracks on the back and skids on the front. I think that vehicle mode might have looked pretty cool on-screen (I’m thinking of Rattrap’s excellent vehicle mode). So bottom line here: decent alternate mode(s). Remarks: As an avid Beast Wars fanatic I’m still looking to complete my collection of Beast Wars toys and the Fox Kids variants are definitely among the harder-to-find ones, at least in Europe. I got Rhinox, together with some others, during my recent trip to San Diego. It’s kind of hard to find a decent rating here. This is definitely a better version of Rhinox than the original toy, but Rhinox never appeared in this form in the series. Also, the Fox Kids color swap doesn’t really work for me here, I must say. So bottom line: I got this toy for completeness’ sake, nothing more. It’s a decent toy, yes, but if you’re interested in it, I recommend getting the original colors instead of this repaint.